Talented lawyer Fiona Stevenson rang work on the morning of 7 July to tell them she was running late. But the 29-year-old never arrived at court in Hammersmith, west London. Her journey to work that day from her new flat in the Barbican complex in the City of London ended in tragedy on the Circle line near Aldgate. Miss Stevenson had dreamed of becoming a lawyer ever since she did some work with a local firm of solicitors at the age of 14 and harboured a long-term ambition to work for the UN. That determination was driven by a strong sense of human injustice which burned brightly within her, according to her boss Colin Reynolds, of central London law firm Reynolds Dawson. "Her entire career history was a testament to her dedication to representing those ensnared in the criminal justice system, but unable to defend themselves," he said. "Fiona was a hard-working, conscientious and supremely able criminal lawyer. The firm will forever be the poorer for her loss. "Within a small practice her bubbly personality, care and compassion for colleagues, as well as clients, were cherished qualities, which will be sorely missed." In a statement to the inquest her family said: "She had a wonderful zest for life. As far as she was concerned, life was not a dress rehearsal, and she was determined to live it to the full." They had last heard from her on the evening of 6 July. He family said she was "happy and contented, full of optimism for the future" and was looking forward to coming home a couple of days later at the weekend. Then, on the following day, when there was no response from her mobile, the family received the tragic news from her employer that she was missing. Bruce Lait, a professional dancer, who was on the train when the bomb exploded, told the inquest how he became aware of the injured Miss Stevenson lying across his lap as the dust settled. Mr Lait said he held her hand felt her squeeze his as she slipped away. Miss Stevenson was born in Cheshire on 22 June 1976. In 1986, she moved with her parents, Ivan and Emer, and younger sister Andrea, to Little Baddow, Essex, and attended New Hall School in Chelmsford and King Edward VI Grammar School in Chelmsford. Her schoolfriend Oliver Nash recalled her "infectious laugh whenever she caught the bus to secondary school" and said she "was polite and superb company". Miss Stevenson went on to Sussex University where she studied law and then took a gap year working for several organisations including the Medical Defence Union and in Paris. She joined the north London firm of Galbraith Branley in 1999 as a trainee solicitor and after qualification in 2001 worked mainly on criminal cases. She also represented clients at Mental Health Tribunals and early in her career was said to have felt great pride in preparing a judicial review and successful appeal at the Court of Appeal. Miss Stevenson joined Reynolds Dawson in 2003. There, she worked as a duty solicitor in court and police stations, and become involved in the firm's main area of expertise - representing clients in fraud and extradition cases and undertook regulatory work. Spurred on by her desire to apply these skills in a different way, Miss Stevenson took a four-month unpaid sabbatical to Belize in 2005. As a volunteer for Challenges World Wide, she worked with the government to develop a staff training manual for child care proceedings there. 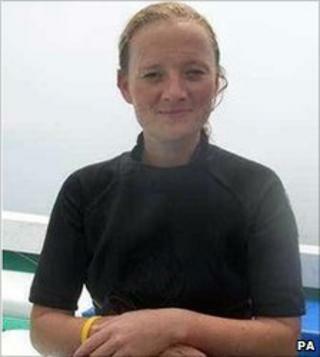 This opportunity meant she could also indulge her passion for diving, and she completed two qualifications and a dive in the Blue Hole while in Belize. She also competed in the 180-mile long, Ruta Maya four-day kayak race and on arriving back in UK in May 2005, announced that her next project was to climb Mount Kilimanjaro. Miss Stevenson returned "refreshed and energised" from her sabbatical. She was interested in gaining higher court rights and also expressed a desire to do a masters in Human Rights. In her spare time, she liked music and dance, played the piano and enjoyed golf. In a statement issued through police in 2005, Miss Stevenson's family said: "Fiona's tragic loss is immeasurable to her family, friends and colleagues. She is so greatly missed and irreplaceable and words cannot express the continued loss. "She has been described as articulate, strong-willed, vibrant, energetic, caring, generous and, as her friends and sister always said, she never held a grudge."